Trained Steller sea lions took part in a Canadian experiment designed to find out why the species is dying out. 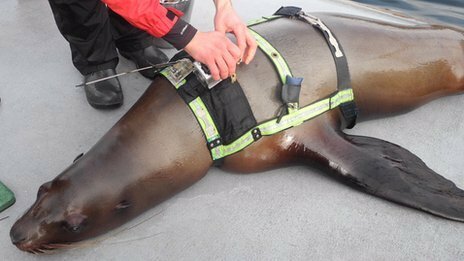 The Canadian research team strapped cameras and tracking equipment onto endangered Steller sea lions to see how they dived for food. Early results from the project indicate that overfishing might not be the main factor in their decline as had previously been thought. Male Steller sea lions measure 3m (10ft) and weigh more than 950kg. This makes them the biggest of all sea lions. These marine mammals once thrived on the shores of the North Pacific Ocean. Now their numbers have dwindled to around 100,000. But no one knows why they are dying out. To investigate why, Prof. Andrew Trites, a marine mammal specialist from the University of British Columbia in Vancouver, has recruited some of them to help him with his experiments. Sea lions are well known for their ability to learn tricks. But with the help of trainers from Vancouver Aquarium, Prof. Andrew Trites has trained four females to follow voice commands and hand gestures that enable them to take part in scientific experiments. “The Steller sea lions are rare in the wild and even rarer in captivity,” explained Prof. Andrew Trites. It’s the first time that sea lions have been used in this way. They have been trained for the project since they were pups 15 years ago. According to one of the trainers, Troy Neil, it has been a long, hard process. “It’s not been easy. It’s taken a lot of time and patience. At times it feels I’ve been spending more time with them than my family,” he joked. Then, to prove the point, one of the sea lions raises herself on her hindquarters, approaches Nigel Walker and plants a firm kiss on his lips. These seals seem happy in their scientific work. Once the seals are fitted with their sensors, they are taken out to open water on their own personal speed boat, the Steller Shuttle. They speed into the breathtaking fjords of British Columbia, where the icy waters are more than a mile deep. It is the perfect place to study how these animals hunts for food. The Steller Shuttle reaches its destination – a small research platform. One of the sea lions, Hazy, eagerly dives into the still waters and, as instructed, makes her way into an enclosure which serves as a kind of underwater laboratory. On the platform, researchers push pieces of fish down a pipe that goes right to the bottom of the water. Then Hazy is told to dive deep into the water. Her sensors measure precisely the amount of energy she uses as she speeds down to catch the fish. Hazy is equipped with a camera so that the researchers witness the transformation from a playful seal to a speeding torpedo. The research team has discovered that it is much harder for her to feed close to the surface – a possible clue to why her kind is dying out. Another early result from these experiments, according to Prof. Andrew Trites, is that these mammals are suffering because they may be eating the wrong kind of food. “It’s called the junk food hypothesis,” he said. For the first time, researchers are looking at the world through the eyes of Stellar sea lions to see if they can reverse the decline of these magnificent creatures.